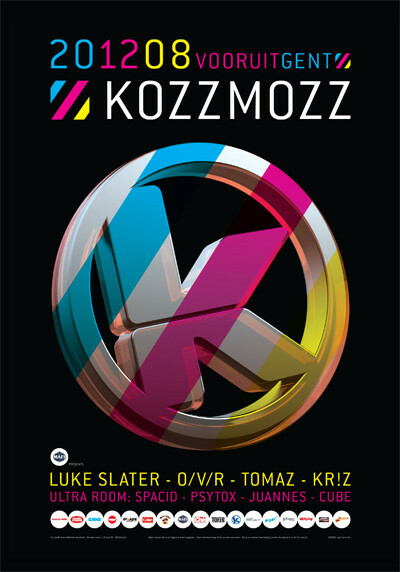 We’re almost at the end of 2008, another great year for Kozzmozz and there’s still one more to go! Let’s make it as memorable as the previous ones! For this one, we’ve invited one of Britain’s true electronic music and Techno pioneers. With a career that spans over 20 years and counting, Luke Slater continues to reinvent himself and push musical boundaries. From early DJ sets back in 1988 and his first release "Freebase" in 1989 through to his new Planetary Assault Systems album due for release 2009 ! His regular appearances at legendary clubs as Berghain, Berlin, Fabric, London and Nitsa, Barcelona retain his superstar status today as a live performer and of course a DJ prepared to deliver. Luke also took the time to set up Mote Evolver back in 2006. A label run by himself releasing limited 12" copies for the collector and digital downloads through the Mote Evolver website. He’s also just released a 12”, with Adam Beyer on Figures. And then something special, as we tend to deliver ... An interactive dj-set between two UK pioneers in the form of James Ruskin, leading force at Blueprint Records, and Regis from Downwards. Both are, amongst lots of other labels, also to be found on Tresor Records which is also the label on which they released their first EP together as O/V/R earlier this year. Be prepared to be amazed. They are joined by Tomaz from Switch on Studio Brussels and our resident Kr!z who is one of those few dj’s who possesses the gift to play great records and have an astonishing mixing technique. Kr!z runs his own label Token records, with releases from Inigo Kennedy, Sub Space (aka Julien and Gonzague), Radial and now Dimitri Andreas ! With the end of the year in sight we have another opportunity to celebrate double so we’ve added the Ultra concept to the festivities again. The better minimal sounds of the moment, brought to you by Belgian dj’s amongst which several young talents who definitely deserve a spot on a bigger event ! Psytox has been around for a while as a dj but is now also producing, expect his second EP on his own label Coïncidence Records around the time of this party! Juannes is the leading force behind the Plus/Minus parties and was resident at P3P. Expect a new concept from him and co-founder of P3P, Prince Off, soon ! Cube is the founder of the Dogstyle parties and resident at Desperados. After making his way into our young talent corner through Poppunt, here he is again through the Switch Young Talent Corner contest ! And also resident Spacid will bring his collection of minimal records. When he’s behind the decks, the atmosphere is always great!